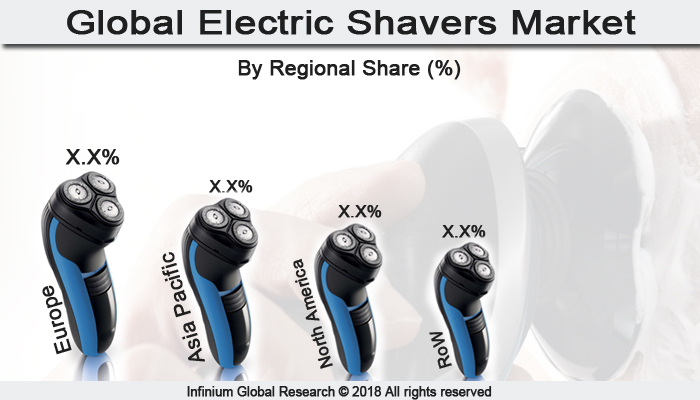 A recent report published by Infinium Global Research on electric shavers market provides in-depth analysis of segments and sub-segments in the global as well as regional electric shavers market. The study also highlights the impact of drivers, restraints and macro indicators on the global and regional electric shavers market over the short term as well as long term. The report is a comprehensive presentation of trends, forecast and dollar values of the global electric shavers market. According to report the global electric shavers market is projected to grow at a healthy CAGR of over the forecast period of 2018-2024. Electric shavers are an electric device used for shaving hair. It is used for the removal of unwanted hair from the body with an oscillating blade that is behind the metal guard. An electric shaver is considered to be the most convenient and efficient method of shaving. There are generally two types of shaver one is foil shaver and the other is a rotary shaver. An electric shaver is used for removing chest hair, leg hair, underarm hair, abdominal hair, head hair and from other body parts. This electric shaver is used by both men and women. It is used by men for removing their facial hair and by women for removing hair from their leg and underarm area. There are two types of electric shaver: cordless and wired. Electric shaver product uses rechargeable batteries for cordless use which is more convenient to use. To avoid any kind of cuts, irritation, and abrasions from traditional shaving method, individuals prefer to use electronic shaving machines. It provides closer shaves without skin irritations. Nowadays, it is extensively used as grooming products among men. Buying a quality shaver serve at least for 5 years and thus electric shaver saves money. It also saves time as it takes less time compared to traditional method of shaving. Electric shavers are now available at retail stores as well as through an online channel. Many large conglomerates are entering to electric shavers market owing to huge growth potential in this market. In addition, different product innovation related to style, less maintenance cost, easy to handle, and long life are some of the key factors that further drives the electric shaver market. Due to the growing inclination of consumers for automation, growing promotion of the product with the help of advertisements & marketing technologies and increasing populations that use this product are also a key factor that is affecting the market positively. On the other hand easily availability of alternatives those are cheaper and can be affordable many hamper the growth of an electric shaver market. As per the geographies, Europe has dominated the market growth for the electric shaver market followed by the Asia Pacific region. Factors that are driving the growth of the electric shaver market in Europe region are growing adoption of the electronic shavers owing to rising beauty consciousness among women and men and product innovations. Further, in the Asia Pacific region due to the growing economy, growth in disposable income level and large population in China and India boost the demand for the electric shaver market. The report on global electric shavers market covers segments such as products, end users and distribution channel. On the basis of products the global electric shavers market is categorized into foil shaver, wet/dry shaver and rotary shaver. On the basis of end users, the global electric shavers market is categorized into male and female. On the basis of distribution channel the global electric shavers market is categorized into supermarkets, hypermarkets, and health & beauty stores. The report provides profiles of the companies in the global electric shavers market such as Procter & Gamble Company, Philips Electronics N.V, Izumi Products Company, Panasonic Corporation, Wahl Clipper Corporation, Gillette Company, Conair Corporation, Helen of Troy Limited, Braun GmbH and Remington Products Company. The report provides deep insights into demand forecasts, market trends, and micro and macro indicators. In addition, this report provides insights into the factors that are driving and restraining the global electric shavers market. Moreover, IGR-Growth Matrix analysis given in the report brings an insight into the investment areas that existing or new market players can consider. The report provides insights into the market using analytical tools such as Porter's five forces analysis and DRO analysis of electric shavers market. Moreover, the study highlights current market trends and provides forecast from 2018-2024. We also have highlighted future trends in the electric shavers market that will impact the demand during the forecast period. Moreover, the competitive analysis given in each regional market brings an insight into the market share of the leading players. This report will help manufacturers, suppliers, and distributors of the electric shavers market to understand the present and future trends in this market and formulate their strategies accordingly.